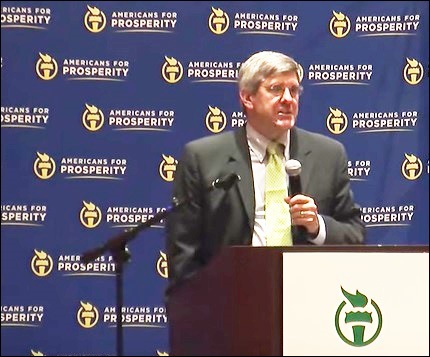 The Koch brothers funded front group, Americans for Prosperity (AFP), has decided to scrub Stephen Moore’s history from its web site now that Donald Trump has proposed Moore to sit on the powerful central bank of the United States, the Federal Reserve Board of Governors. Google caches of Moore’s extensive history with the organization now lead to error messages. The billionaire Koch brothers, Charles and David, are majority owners of the fossil fuels juggernaut known as Koch Industries. Moore’s ties to the Koch brothers and his papers, speeches and books posturing on topics near and dear to their hearts go back decades. Moore has also been an attendee and speaker at the semi-annual, super-secretive political strategy meetings organized by Charles Koch to tilt U.S. elections to the right. In the book Sons of Wichita: How the Koch Brothers Became America’s Most Powerful and Private Dynasty by Daniel Schulman, the author writes that at a June 27-28, 2010 event at the St. Regis Hotel in Aspen, Colorado, Moore presented a talk titled “Understanding the Persistent Threats We Face.” That talk was tailored to please a bevy of Wall Street Masters of the Universe and old-money corporate heirs who were in attendance. Like the Koch brothers, Moore is a big fan of deregulation, privatization, small government (meaning gut the social safety net) and climate change denial. He penned the infamous “New York’s Climate Suit Against Exxon Is Like Salem Witch Trials” at Investor’s Business Daily in 2015. There are a number of good reasons that a Koch-funded group would want to scrub their connection to Stephen Moore right now – major among them being that the Koch Industries front group, Freedom Partners, has already embedded a sizeable number of Koch loyalists in the Trump administration. There is very little to distinguish Freedom Partners from a tentacle of Koch Industries. As of July 2018, eight of its nine members of its Board of Directors is a current or former Koch company employee. As of February 2019, the Board Chair of Freedom Partners is Mark Holden, who simultaneously serves as the General Counsel of Koch Industries. The 2016 tax return for Freedom Partners lists Robert Heaton as CFO and BDK LLP as the tax form preparer. Those two names also appear on the 2016 tax filing for the Charles Koch Foundation. SourceWatch reported in April of last year that a dozen people who previously worked at Freedom Partners are now working in the Trump administration. Among that group was Marc Short, former Freedom Partners’ President, who became Director of Legislative Affairs for Trump. Short stepped down last year after achieving many of Freedom Partners’ stated demands. Equally of note, an unprecedented 12 lawyers from the giant Jones Day law firm headed to important posts in the Trump administration in one fell swoop on January 20, 2017 – Trump’s inauguration day. Jones Day had been a lead law firm for Koch Industries’ mergers and acquisitions for years as well as representing Freedom Partners. In February of last year, Lee Fang and Nick Surgey, writing for The Intercept, revealed a secret memo from the Koch brothers’ sprawling network of wealthy donors, which lauded the major objectives it has achieved under Trump. The ability of the Kochs to continue to realize their agenda in the Trump Presidency, a man who ran on a populist agenda, illustrates the abject failure of Congress and corporate media to do their jobs for the American people.